GeoStone is a hollow-core, split faced textured wall system that has all the looks needed for making beautiful decorative landscaping walls and more than enough strength to build a fully structural retaining wall. GeoStone has a revolutionary open core design that allows for individual units to be connected together by filling the cores with angular aggregate. 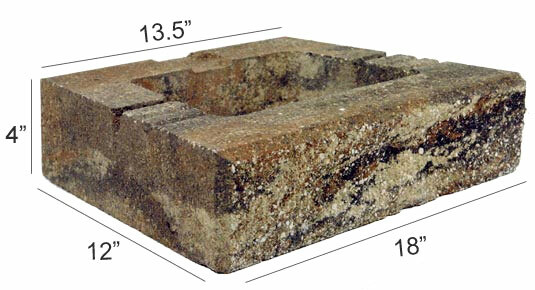 This "rock interlock" connection method reaches superior wall strength performance. The open core design gives GeoStone walls great design flexibility and drainage properties. Other retaining wall systems are mostly solid units that require lips, clips, notches, pins, or lugs to interlock the units together. These types of walls are limited in design, are heavy and more difficult to handle, and drain poorly in comparison to a GeoStone wall. Contact Flagstone's Hardscape Consultant in your area for further assistance. Each unit has a core space of 1/4 cubic foot. Tan/Charcoal, Cream/Orange/Pewter, and Indian Summer.